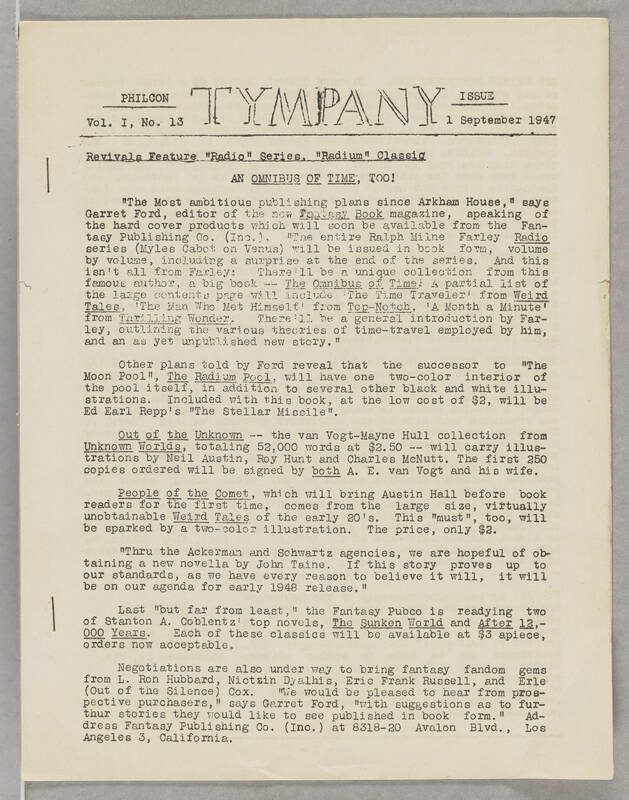 PHILCON TYMPANY ISSUE Vol. I, No. 13 September 1947 Revivals Feature "Radio"Series. "Radium' Classic OMNIBUS OF TIME, TOO! "The most ambitious publishing plans since Arkham House," says Garret Ford, editor of the new Fantasy Book magazine, speaking of the hard cover products which will soon be available from the Fantasy Publishing Co. (Inc.). "The entire Ralph Milne Farley Radio Series (Myles Cabot on Venus) will be issued in book form, volume by volume, including a surprise at the end of the series. And this isn't all from Farley: There'll be a unique collection from this famous author, a big book -- The Omnibus of Time. A partial list of the large contents page will include 'The Time Traveler' from Weird Tales, 'The Man Who Met Himself' from Top-Notch, 'A Month a Minute' from Thrilling Wonder. There'll be a general introduction by Farley, outlining the various theories of time-travel employed by him, and an as yet unpublished new story." Other plans told by Ford reveal that the successor to "The Moon Pool", The Radium Pool, will have one two-color interior of the pool itself, in addition to several other black and white illustrations. Included with this book, at the low cost of $2, will be Ed Earl Repp's "The Stellar Missile". Out of the Unknown -- the van Vogt-Mayne Hull collection from Unknown Worlds, totaling 52,000 words at $2.50 -- will carry illustrations by Neil Austin, Roy Hunt and Charles McNutt. The first 250 copies ordered will be signed by both A. E. van Vogt and his wife. People of the Comet, which will bring Austin Hall before book readers for the first time, comes from the large size, virtually unobtainable Weird Tales of the early 20's. This "must", too, will be sparked by a two-color illustration. The price, only $2. "Thru the Ackerman and Schwartz agencies, we are hopeful of obtaining a new novella by John Taine. If this story proves up to our standards, as we have every reason to believe it will, it will be on our agenda for early 1948 release." Last "but far from least," the Fantasy Pubco is readying two of Stanton A. Coblentz' top novels, The Sunken World and After 12,000 Years. Each of these classics will be available at $3 apiece, orders now acceptable. Negotiations are also under way to bring fantasy fandom gems from L. Ron Hubbard, Nictzin Dyalhis, Eric Frank Russell, and Erle (Out of the Silence) Cox. "We would be pleased to hear from prospective purchasers," says Garret Ford, "with suggestions as to furthur stories they would like to see published in book form." Address Fantasy Publishing Co. (Inc.) at 8318-20 Avalon Blvd., Los Angeles 3, California.